Next time I'm sick I sure hope that a menagerie from the local zoo won't come knocking at my door. The last thing I want in bed with me is a tortoise, and I seriously doubt an elephant would fit in my bedroom. The thing is though, this whole scenario makes for a delightful picture book. Heard of A Sick Day for Amos McGee? Well, you should have, considering it was just chosen this week as the 2011 Caldecott Medal winner. The humble Amos McGee lives in a simple, muted world and provides a welcoming contrast to the vibrant, glossy, eye-catching pages and bold characters so popular in today's children's literature. Amos, a faithful, elderly zookeeper, lovingly cares for his zoo animal friends day after day. He knows each and every animal personally, provides encouragement and helps them all with their problems. Then, one day, Amos spends a sick day at home. The elephant, tortoise, penguin, rhinoceros and owl immediately notice his absence and board the bus to cheer up their faithful friend. The book is illustrated by Erin E. Stead and written by her husband, Philip C. Stead. It's such a lovely story -- so very heartwarming with a quiet humor. You can't help but smile while reading about Amos and his friends. And the illustrations are full of so many little details that, at first, we didn't even notice the little bird that tags along. And, do we ever adore the red and blue sock-footed, shy penguin and his bright red balloon! Erin Stead uses an interesting woodblock printing process for making her pictures. Even Amos' pajama stripes are lovingly printed in this manner. After she prints the shapes she draws in extra details with a pencil. Really, I could go on and on about the illustrations, but for me, what really makes this book a winner is the main character, Amos. It's not always easy to find books for children that show elderly individuals in a positive light. Even though my daughter loves her great-grandparents and sees them often, she is still a little cautious and wary when around the elderly. Partly, I blame books and TV. Those mean, scary witches almost always are depicted as elderly, humped over women. But, here we have an amiable and tender man, Amos, who loves animals and wears bunny slippers. I've never seen a more lovable, elderly character in my life. 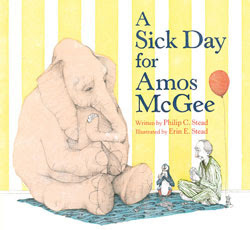 A Sick Day for Amos McGee deserves all the attention it has recently garnered. If you haven't picked up a copy yet, please do. You won't regret it. My daughter is fascinated with Erin Stead's blog post about the woodblock printing. After last week's successful printmaking craft, we thought we try using a faux woodblock printing technique this time. Obviously I'm not going to let my kindergarten-aged daughter carve wood with sharp blades, so we had to improvise. 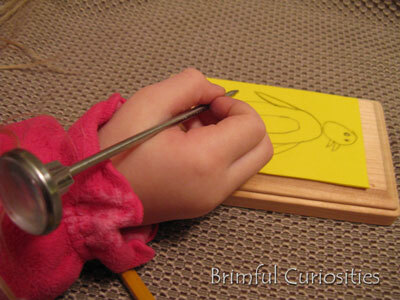 We still used a block of wood, but first attached a piece of craft foam paper to the top, to make carving easier. It's similar to making block prints with Styrofoam. 1. Cut craft foam to fit the wood block. Size and shape will depend of size of wood block and desired image. 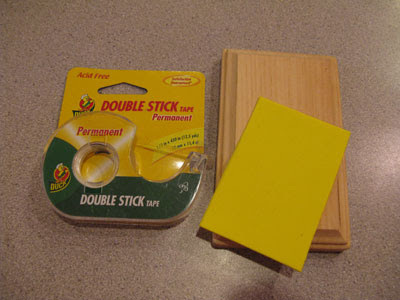 Securely attach craft foam to the wood block using double-sided tape. 3. Using a large stamp pad, apply ink to the foam block with a rubbing motion. Carefully place the image onto a page of paper and press firmly down. 4. Remove block and view your beautiful printed block image! My daughter loves the little penguin in A Sick Day for Amos McGee so she chose to draw her own penguin. 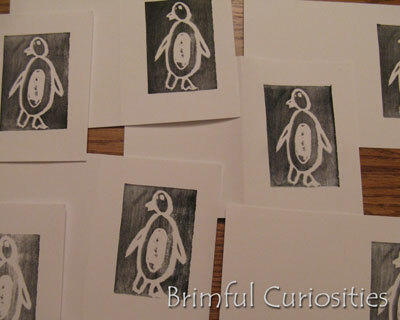 She stamped several homemade printed cards using her penguin "woodblock." They'll make nice thank you notes. 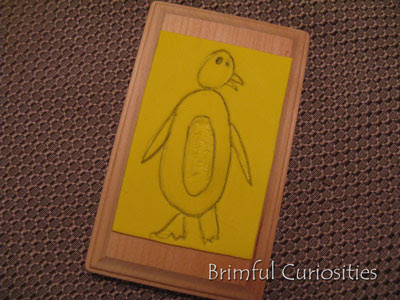 The penguin note-card printing craft is a perfect activity for this time of the year. This week is National Letter Writing Week and Penguin Awareness Day is coming up on January 20th. Very cool project! You could do so many different things with this ideas. Oh my word! These are AMAZING! Didn't you guys do well? I am very impressed! I love them love them love them. Can't wait for Red Ted to be a little older! Thank you for linking up too! That gets me thinking...... I have some foam cartons I've been saving, and this could be fun. Just Brilliant! I must get this book too. Thank you for sharing. I really like this. Her penguin is so cute! The books sounds great and I love the craft! I think we linked up at all the same places today! Wow. They turned out great! We made a name stamp before with the foam and a wood block, but I definitely like yours! The cards are so sweet!! Very clever. My kids would like this. So cute! I love making homemade stamps. You can use so many differnt things. I've used cardboard and sponges but never foam craft sheets. 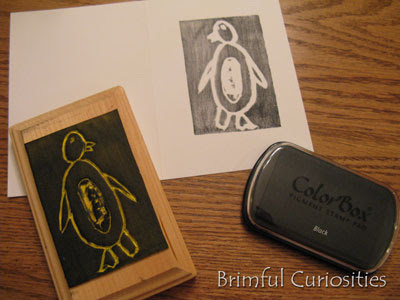 Really cute penguin too and the best part about homemade stamps you can use them again and again! Looks and sounds like a must have! No wonder it won an award. I love the craft idea; thanks so much for sharing. 1. I am jealous that you got your hands on the Caldecott winner already. Go you!! 2. I LOVE this art project. My girls would enjoy this. We might have to give it a whirl! I haven't read this book yet, myself. But my son came home from kindergarten today to tell me that the librarian read it to them and then they worked on watercolors based on the book. I like your art project for it, too. Love her block printing! What a great project. I loved the book and was very happy with its Caldecott win. Thanks for sharing the info about the art - and your own project. Looks like fun! 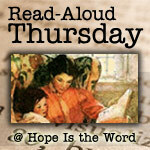 I stopped by from read-aloud Thursday. Looks like a great book. I'm saving your blog as I hope to try this carving project soon with my kiddos. I wrote down the name of the book in my "library list." I really love this. Would love for my kids to make their own set of thank you cards. thanks! Thanks for taking the time to link for my Round Robin.. I loved this idea... Is hard to cut the shape out? Wow! This looks AMAZING! How old is your daughter? She's a real artist with the penguin drawing and the prints are so cool looking. I'm filing this one away! I loved making woodcuts when I was younger. I'm definitely going to do this project with my boys. Thanks for the idea! Your craft is awesome :) This book looks great, you just don't see this kind of illustration anymore...I've got to get a copy! You're right about the elderly thing and I never really thought about it until you mentioned it here. Now I'll be sure to make an effort to point out kindly elderly folks to my daughter as she grows. She absolutely adores her great-grandma "Nana". Our library does not carry this title yet, but I will keep my eye for it. It sounds like a nice read.